Today, Nike unveiled the U.S. Men’s National Soccer Team away jerseys they will wear as they compete against the world's best in Brasil. I'm excited to fill myself with false hope as I root for America this summer. Unfortunately, I'm not a fan of these jerseys. 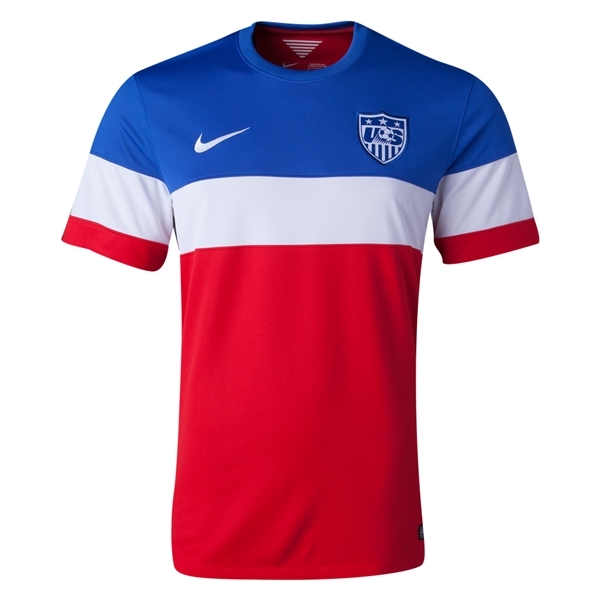 The Nike press release described them as "deeply patriotic", but at first glance, I thought I was looking at a jersey for France. I couldn't find a great image of the back of the jerseys to get a look at the custom font they created. From the looks of the one below, the numbers seem really jagged and amateurish. This seems like a huge contrast from the stark white uniforms that they will wear for "home" games. Personally, I enjoy these ones more. The most confusing part of the jerseys, was the choice of "USA fans" they used to market them: the most hated football player in the NFL, a movie director who is notoriously known as a basketball fan, some skateboarders and an upcoming indie rock band of 3 sisters. I'm usually a huge fan of what Nike does, but they lost me on this one. UPDATE: Marcus Dilley, a uniform designer from the UK, also thought it looked like a jersey for France so he gave it an updated palette that made it more in line with America's flag. I also don't mind the tonal stars and stripes elements.